We attended Stéphane Derenoncourt’s most recent New York tasting of his Napa Valley wines — his first American bottling. We tasted his single vineyard 06 and 07 Cabernet Sauvignons, Cabernet Franc, Merlot, and Syrah. 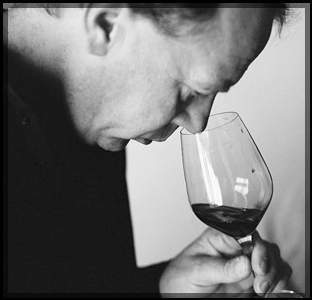 Derenoncourt made his reputation as a rock star winemaker with the acclaimed 1996 right bank Bordeaux vintage from Château La Mondotte – St. Emillon. His focus in California is not on style, but the character of the fruit, resulting in wines that reflect the new world Napa Valley terroir, with prices to match. And though all his wines showed beautifully with excellent aging potential, my favorites were not any of the typical powerhouse varietals associated with Bordeaux, but rather one more frequently recognized as the red darling of the Loire Valley, Cabernet Franc. My No. 1 wine, the 06 Cabernet Franc, was dark ruby in color with soft crushed strawberries on the nose. On the mid-palate, this wine is incredibly refreshing with nice acidity, and should pair well with many different sorts of food. A lingering finish with noticeable black pepper helps to balance the acidity. But collectors, don’t get your hopes up: only 225 cases were made. Derenoncourt’s 07 vintage is not yet available, but was there for us to taste, which brings me to my No. 2 wine — no surprise here, his 07 Cabernet Franc. Although drinkable now, this wine showed perhaps even more potential than the 06 vintage, despite the tightness of the fruit — lush, dark raspberries, which could soften with time into juicier, red fruits, though I’m not sure I’d totally welcome the change. “I drink so much Cabernet Franc from the Loire Valley, I’m just not sure as to how I feel about Napa Valley Cabernet Franc,” he told me. The 06 Cabernet Sauvignon (100 cases produced) is a dark ruby, with a bouquet of wet black fruits. There is some noticeable toasted oak and fairly hot alcohol, but it is well balanced with an elegant finish. On the other hand, the 07 Cabernet Sauvignon has slightly more butter on the nose, and a pleasant sweet potato aroma, with plum and blueberries. Soft to medium tannins help balance the fruit for an overall more complex wine than the 06, and I think it has the potential to age even better. Originally being a right bank Bordeaux vintner, Derenoncourt’s 06 California Merlot (100 cases produced) must have been especially important to him. Black licorice on the nose and mid-palate along with firm tannins and a pleasant, but not overpowering, finish make me believe this wine still has many good years left in the bottle, though it could be enjoyed now. The 07 Merlot I found even more aromatic, with red licorice, cranberries, and a rhubarb pie component. Soft tannins with this lovely bouquet again says to me drink now, or hang on. The Syrahs were my least favorite of the wines, but to be fair, competition was tough. And with 600 cases, collectors will have an easier time finding these. The 06 is ruby/purple in color, with plums and wet earth on the nose, reminding me of the air inside an organic produce section of a market. The firm tannins work well with the fruit, but felt off balanced with the acid. The 07 Syrah had a bouquet of nice red fruits, and an elegant complexity, but is is a little tight at the moment, and should be better in a year or so. The Lake County Cabernet Sauvignon from Beckstoffer’s Red Hills Vineyard — 575 cases produced, and only a fraction of the price of Derenoncourt’s other Cabernet Sauvignon — were my favorites after the Cabernet Francs. The 06, new world in its bouquet with bell pepper, soft blue and black fruits, has a nice balance of toughness and fresh acidity, with an enjoyably long finish. And the 07 is actually even bigger on the nose, with the same dark fruits, but also nice vegetal characteristics of red peppers and fresh green lettuce. This will age gracefully, but could be enjoyed immensely by many right now. After the tasting, I realized that I know several jazz musicians other than Ben who are interested in wine. Julien Labro, a native of France and my colleague in the Hot Club of Detroit; the bassist John Clayton, a collector of French and Italian wines; the keyboardist John Medeski, who was even interviewed by Wine Spectator; and the jazz guitarist Anthony Wilson, a fellow wine blogger. What I didn’t know is how fast I would meet people who work in the wine industry with an interest in jazz. My good friend Anthony Minne — a sommelier and wine consultant in Michigan — is the son of Judy Adams, a Detroit area radio personality of more than 30 years with a concentration on jazz. With jazz always around the house, Anthony developed an interest and good ear for it, and our conversations are often on the music. And a couple weeks ago, Ben lent me a book by the wine writer Alice Feiring, whom I’d heard of but had not yet read. A few days into Feiring’s The Battle for Wine and Love, we randomly bumped into her at The Ten Bells — which I’m learning truthfully is the industry’s favorite New York City wine bar — where I was delighted to meet the author of the book I’m currently reading. Coincidentally, I spotted Feiring at Smalls, a west village jazz club, last Thursday night checking out, no coincidence here, Anthony Wilson. It makes me wonder if some of my other favorite wine industry heavies like Asimov, Parker, Vaynerchuck, Zraley, like to hang out and listen to, as we say in the jazz world, sides. Perhaps a future entry could be “Wine Critic’s Music of Choice.” Lucky for me, this might require a visit to their cellars — for interviewing purposes, of course — likely the only way I could ever enjoy again the caliber of wines I sipped and spit on Tuesday. on June 14, 2010 at 6:32 pm | Reply Andy R.